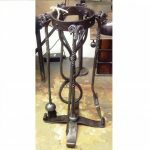 Our Wavy fire tools are made on the forge, here at Allerford Forge by West Country Blacksmiths. The fire tools are finished with a traditional beeswax finish, which was sourced locally. SKU: 34.99. Category: Fire Tools and Fireside Accessories. Tag: Tools. Our Wavy Fire Tools are made to order here at Allerford Forge, by the team behind West Country Blacksmiths. The fire tools are finished with a traditional beeswax finish, which was sourced locally. The fire tool pictured stand at roughly 600mm in height. The pictured represents the item, the item received may slightly differ as each item is handmade. Price from £34.99 per tool. We plan to make and send all items within ten working days. Please note that all our prices include vat, packaging and postage.